Building GUI for PowerShell Scripts – Why a GUI ?A GUI can often make a task easier and more constrained for less experienced users for example our “Service Desk” Folks.PowerShell is built on the .NET framework which has entire set of capabilities for building GUI’s. These capabilities are accessible to powershell but require quite lengthy and complicated coding. 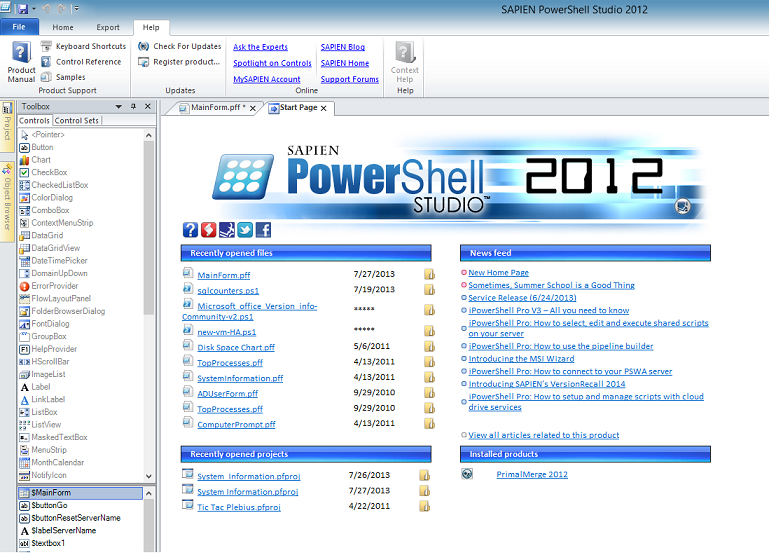 To avoid this complications i recommend using a Nice Tool from Sapien, PowerShell Studio 2012. PowerShell Studio Enables you to package your script into executables (.exe) and share it with others who have relatively less scripting experience. After the Trial Expires you can extend the functionality by procuring a license key from sapien. 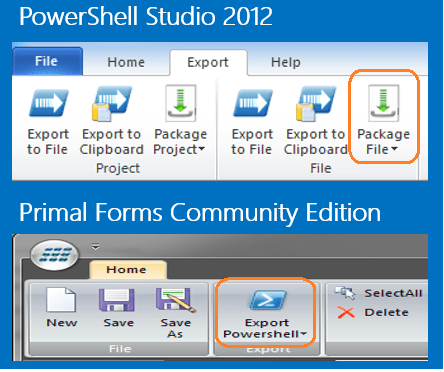 You can also use Primal Forms Community Edition, No Export to Executable option in Primal Forms Community Edition. PowerShell Script Editor – Awesome Script Editor, But now PowerShell v3-v4 script editor also turn out be a good option. PowerShell Forms Designer -An easy Drag and Drop way of creating PowerShell Scripts, saves lots of time and error by doing it the manual way. Out-GridView – An easy way to turn output to graphical view. 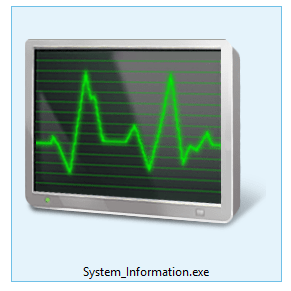 Will create a very simple Tool to extract System Properties for a Server. 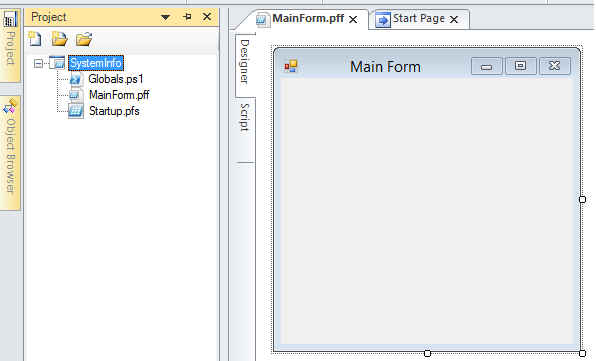 Here a look at the Final Tool and also its .exe file (with a custom icon). 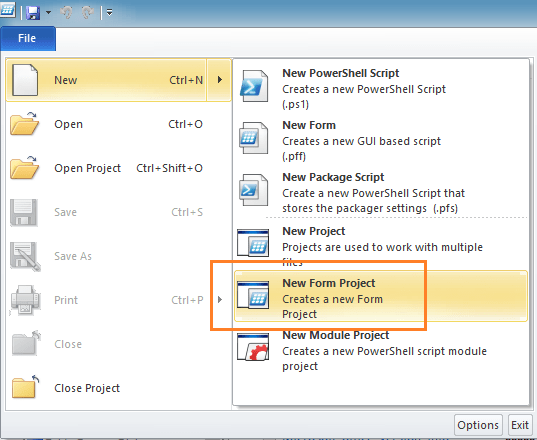 1) Open PowerShell Studio 2012 and Click on New, New Form Project, Feed in the Project Name in my example its “System Information” and click on Create. 2) Next we need to add controls to the main form, Click on Object Browser on the left pane and append the appropriate control objects to the form, below i have shown a screen cap of which all controls need to be appended from the object browser. Once you append the controls to the MainForm, next you need to change certain properties for the control objects. Here is a list of changes which you would need to make on each control. 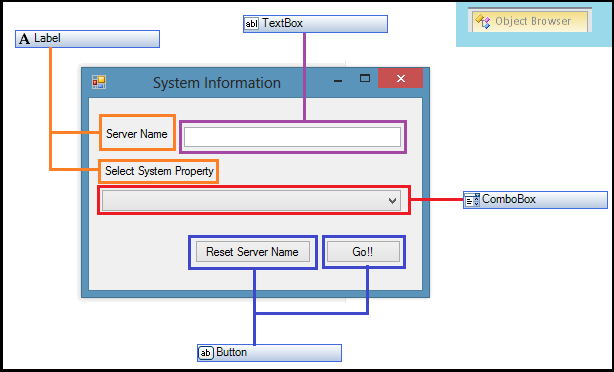 Label – Change the text property to “Server Name” and “Select System Property”. ComboBox – Change the Drop down style to Dropdown list so that users cannot manipulate its values. 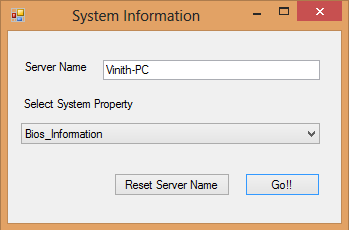 Button – Change the text property to “Reset Server Name” and “Go!!”. Next we will start with the actual coding, Double click on the Form in GUI which would open up the Script view of the form $OnloadFormEvent. Inside it we would initialize the Array of objects and also add the same to the combobox. 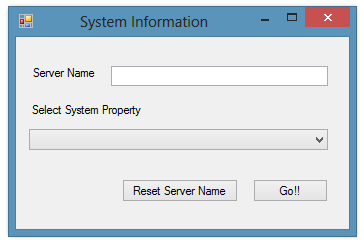 Next we again go back to the designer view and double click on the “Reset Server Name” Button which would take us to its “Click” event.When a user clicks on this button it would call a clear method on textbox1 which would result in clearing its contents. Next we again go back to the designer view and double click on the “Go! !” Button which would take us to its “Click” event. 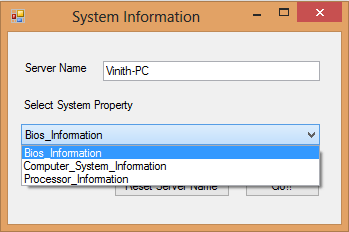 This is what the script is all about, When a user types in the server name in textbox and selects one of the system property of his interests and clicks this button an Out-Grid view form would pop up which would show a detailed report for the system for that particular system property . 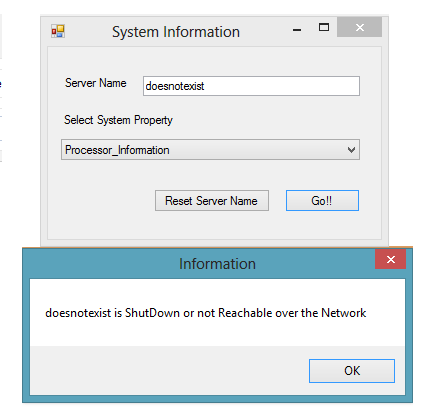 Also note i have illustrated a small sample of how we can use the Try/catch block to trap errors.For example if the user types in a wrong system name which is not reachable over network or is shutdown an appropriate warning error message box would pop up. Also note that with the PowerShell Studio Snippet view has a message box snippet which when dragged into the script drops in a scriptblock for “MessageBox” without the need for any additional coding. Here’s the Script which we need to type in to the “Go” Button Event. 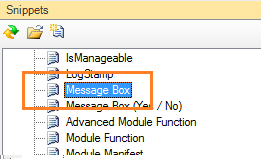 # Work only if Textbox1.text input is Not Null. Out-GridView -Title "$($combobox1.SelectedItem) for $servername"
# Pop up a windows message box indicating the type of error. Here i have illustrated a small demo of how the Final Execution of the Tool Would Look. Nice, so you can see our tool works perfectly fine. Note that you can dig more into the try-catch block and trap each unique error with its unique catch block. I hope this blog post on “Building GUI for PowerShell Scripts” helps you in paving the stepping stone for you PowerShell Script GUI’s. Right, it is very good IDE, but it is very expensive..
Not really that expensive. You need to get it on a good sale when they occur. Even then, a great tool is worth it's weight in gold. What do think, which is the best portable PowerShell editor with intellisense? The term 'Load-Combobox' is not recognized as the name of a cmdlet, function, script file, or operable program. Check the spelling of the name, or if a path was included, verify that the path is correct and try again.